It seems that the new Emergency Committee for Israel (ECI) is based out of the same office as the old Committee for the Liberation of Iraq (CLI), suggesting that, Yes, Virginia, the same people who led the march to war in Iraq are behind the new Emergency Committee, which, in its very brief existence to date, has attracted a lot of mostly critical attention in the blogosphere. That address happens to be the same as that of Orion Strategies, a public-relations consultancy owned and operated by renowned GOP lobbyist Randy Scheunemann, who, in addition to serving as president of the CLI, has been retained since the 2008 elections as Sarah Palin’s personal — and Bill Kristol-approved — foreign-policy trainer. Now, this may just be an amazing coincidence, and Scheunemann may have no ties whatsoever with the Emergency Committee, although, as an old chum of Kristol’s at the Project for the New American Century (PNAC) and co-signer along with Gary Bauer, of a number of PNAC letters, that seems somewhat unlikely. So, does Orion have the ECI account? The CLI, which was organized in large part by the White House, was also closely tied to Ahmed Chalabi’s Iraqi National Congress (INC) as Jim found back in 2003 shortly after the invasion. 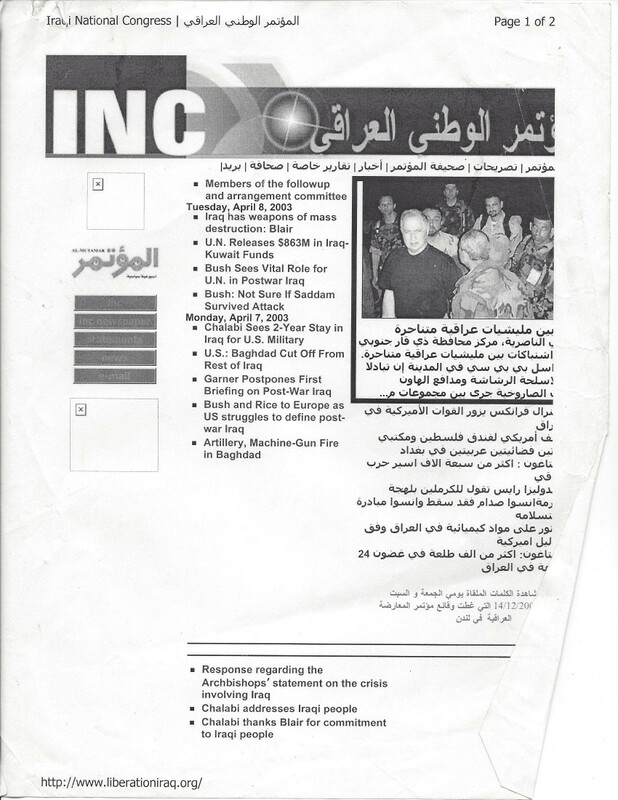 On April 8 of that year, he happened to type in the CLI website (http://liberationiraq.org/), and, to his great surprise, got the INC website instead. He immediately printed out what appeared on his screen, a scanned copy of which you can see here. (Note the address on the bottom and the destination at the top.) He then phoned Scheunemann at Orion‘s offices. He mumbled something about how both the CLI and the INC used the same server in London. But it seems that the two sites were being run by the same entity or, worse, that the INC, which, perhaps not coincidentally, was based in London, used U.S. taxpayer money to run CLI’s website, as well as its own. Like other neo-cons, Scheunemann, who no doubt was handsomely paid by the INC, appears to have been duped by Chalabi whose loyalty to the United States — as opposed to, say, Iran — is now very much in doubt. Shultz: There was a group — there was a committee that didn’t really exist, was a name, and it supported the war. Solomon: What do you mean it didn’t exist? Shultz: It didn’t exist in the sense that it never met, and I don’t even know who the members of it were. That’s often how neo-cons work. Of course, the invasion of Iraq, so ardently championed by the CLI, ultimately resulted in a serious deterioration in U.S. influence throughout the Middle East to the benefit of both Syria and Iran, not to mention Hezbollah and Hamas, and, conversely, to the detriment of Israel’s security. That some of the same geostrategic geniuses are now behind the creation of the Emergency Committee for Israel should give pause to anyone who actually cares about that nation’s future. Matt Duss reminds us that the Weekly Standard‘s Michael Goldfarb is another link between the ECI and Scheunemann. Politico’s Ben Smith referred to Goldfarb as an “adviser” to the ECI. Back in January, Goldfarb joined Orion as a senior vice president of communications. Come on Eli, your conclusion is too dire. You know that many roads lead to Rome. I’m beginning to believe that reducteo ad absurdum may be the quickest route to change. One could argue that the bombing of Laos and Cambodia lead to US withdrawal from Vietnam. Perhaps a quagmire is just what we need to pop those Imperial dreams. Not that we aren’t in a quagmire as is, but perhaps a bigger mess is just what we need. jim, what happened to your colleague’s (Jim Smith?) part 2 paper on Israel/US policy over at Asia Times? The first part was powerful and presented effective synopsis of recent events. mighty generous of you, Scott, to volunteer Iranian blood to rub American noses in.